1. Used for carbon steel,iron and other metal material. 1. IGBT inverter technology,current-type control,perfect quality and performance. 2. Controlled by electric reactor,little spatter,deep welding pool,good welding seam. 3. Closed circuit feedback,constant voltage output. 4. Suitable for welding over 0.8mm thickness materials,operated from all position and conditions. 5. 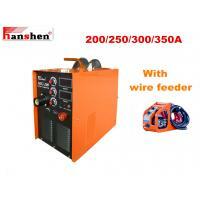 Power source and wire feeder is integrative(MIG200Y/250Y),convenient to operate. 6. Power source and wire feeder is separately(MIG200F/250F),suitable for long-distance welding,the machine also can work with pull wire torch to weld aluminium. 7. Slow wire feeding during arc starting,remove the tip ball after welding,easy arc-starting.